I rarely get this message but it's nice to see it published via Growl, using my OSX Notifications module which is a Growl bridge for NetBeans Platform notifications. I'm not entirely satisfied with the way this message is presented because I would need a "Close" button, not an "OK" button. Also -- clicking on that hyperlink seems to open a new window behind this dialog. Anyhow, there isn't much I can control since we have a lot of native components due to the broken OpenIDE AWT NotificationDisplayer API which encourages custom JComponents. This particular notification for example should use no custom component. 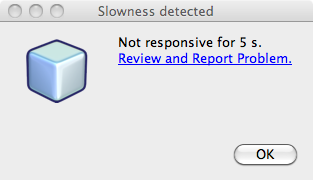 It should just say: "Slowness detected: Not responsive for 5 s" and then clicking on the (Growl) notification should open the "Report Problem" dialog.